Portable Refrigerated Rinks for small commercial or residential use. 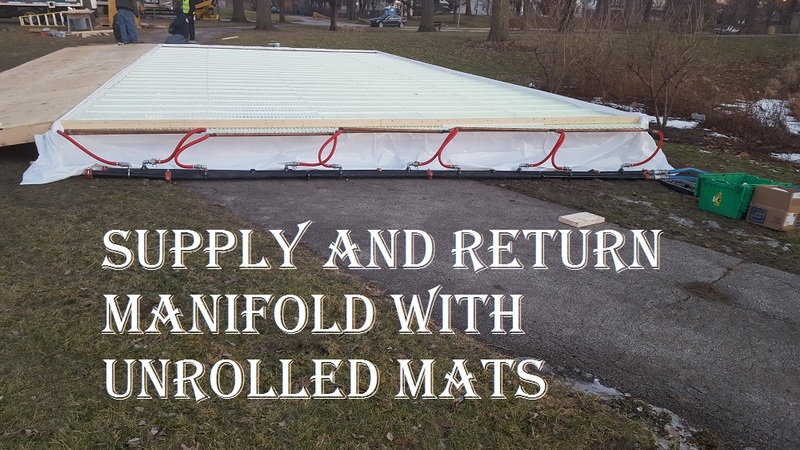 Reliable Portable Refrigerated Rinks for the yard, business, or any event. Iron Sleek Outdoor Rinks supplies portable refrigerated rinks in several convenient sizes and configurations. Portable means that the refrigerated rink can be disconnected and stored away. Our owners are mechanical engineers that can help design the ideal system for your climate and site. 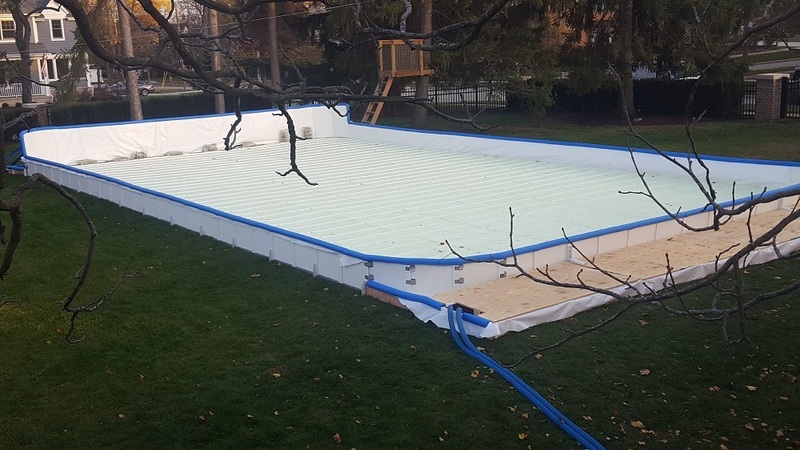 Our basic rink designs will keep ice for as long as it is under 50 degrees F. For days that go beyond, the system will easily recover when the cold comes back under 50 F.
With a portable rink, there is no need to permanently lay concrete or create a permanent infrastructure. You can continue to use your rink site as flex space. 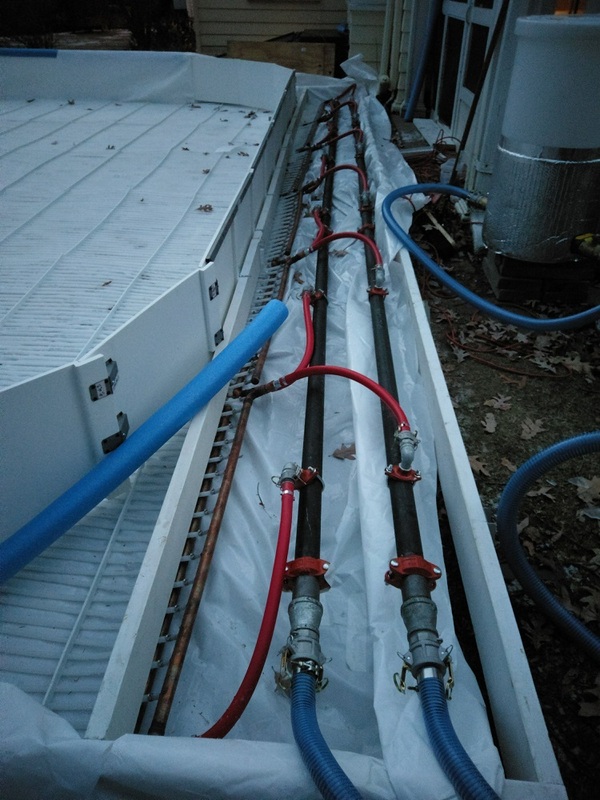 Our typical system is comprised of the most reliable chillers, easy rollup refrigeration mats, a manifold box and a rink frame with rink boards. Iron Sleek poly steel rink boards are made specifically for refrigerated rink enclosures. 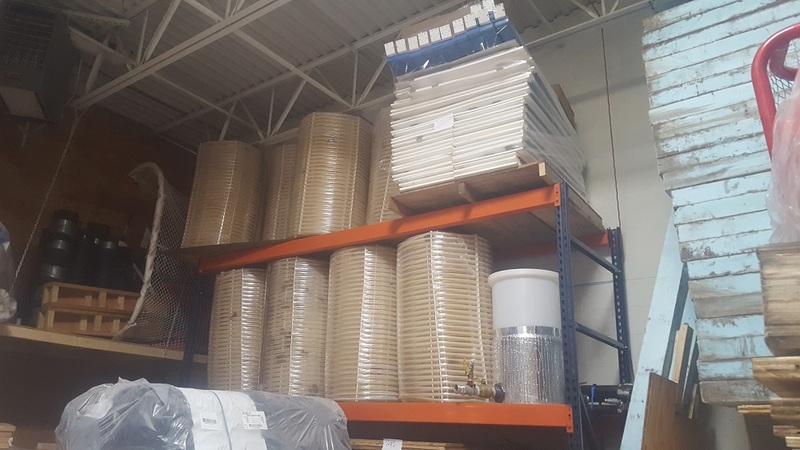 Header Supply and Return. Quick and easy snap on connectors. End of season rink stored on rink, size 32 by 56. How does portable refrigeration actually freeze water? Water freezes at 32 degrees F (0 degrees C) while other chemicals can have a lower freezing point. For example, windshield washer fluid does not freeze in the winter months while simple water would be a block of solid ice. 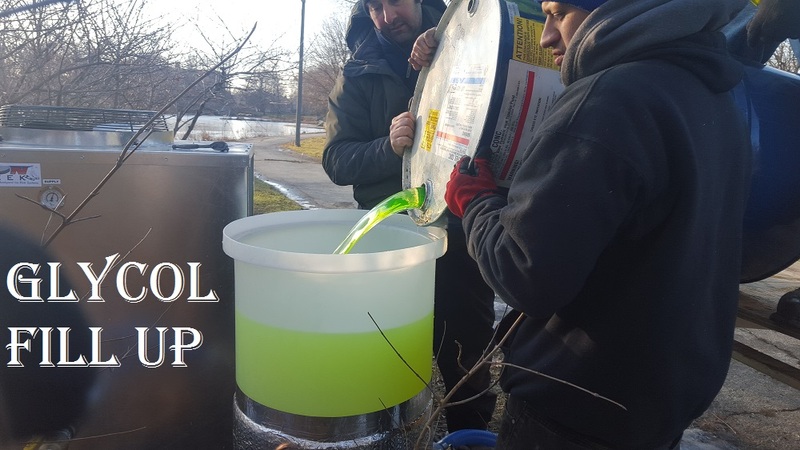 A refrigerated ice rink system takes advantage of this fact by chilling liquid Glycol, which is better known as anti-freeze, to well below the freezing point of water (say 14 degrees F) while pumping it through mats that are below the ice rink surface. These mats are then sprayed with water causing the water to freeze around and above the mats. -A flat surface. Flat means level within 2" across the entire rink. If you have a sports court or a patio, there is a decent chance that your surface is flat enough. Flat is not an approximation, you will need to know how to use a laser transit to figure this out. Using a transit is simple but it may be a good idea to still consult a construction professional for some help. If you have a graded site, you may also be in luck for being flat enough. The most cost effective way to create a flat surface is to have a rink site excavated and graded within 2". As a reference point, an excavation for a 32 by 60 rink could cost anywhere from $800.00 to $2000.00. Excavation is usually done with a skid-steer. A standard skid-steer only requires a 6 foot opening to get into your yard. 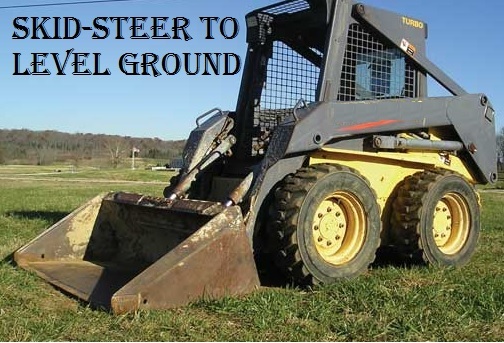 There are also special skid-steers that are only 3 feet wide that could also get the job done. Another way to get a level surface is by spreading sand or by building a platform. Spreading sand is a mess but sometimes a job may call for it. Platforms are tedious and expensive but when done correctly, they are awesome. Below are some platforms that we have built to create a level surface for ice. 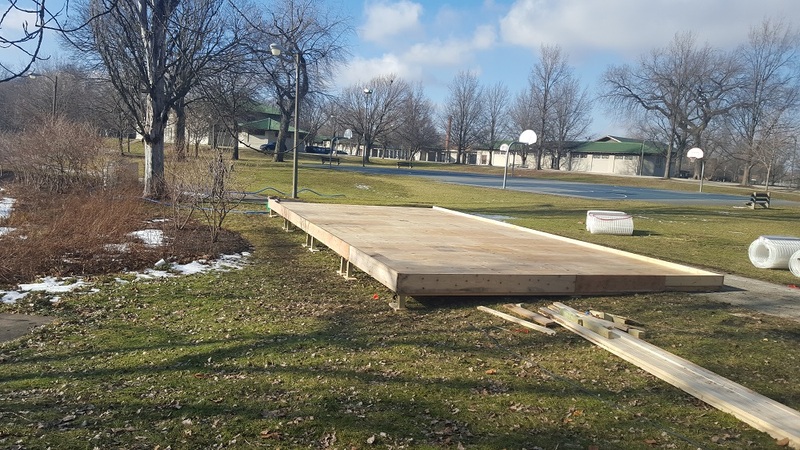 It is EXTREMELY critical to build a platform rigid enough so that the ice does not shatter when skated on. Consider this example, a sheet of glass on a flimsy table would shatter while one on a rigid work bench would not when weight was up against it. An ice skating platform is the same way, it must be built to spec. 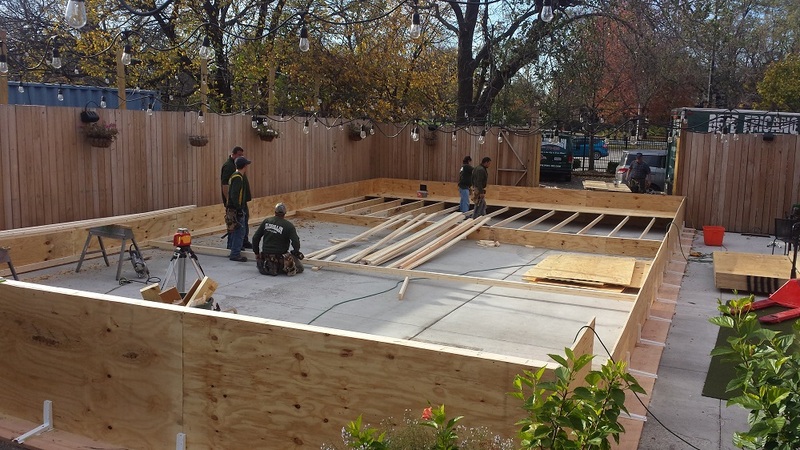 A platform is a great way to build a rink over your pool. Below are a few example of rink platforms. -Electrical power to source the chiller. To put this in perspective, a 20 by 40 refrigerated rink will minimally require 60 amps at 220-240V single phase. This is the same type of power used for your residential AC, electric oven, and some a dryers. 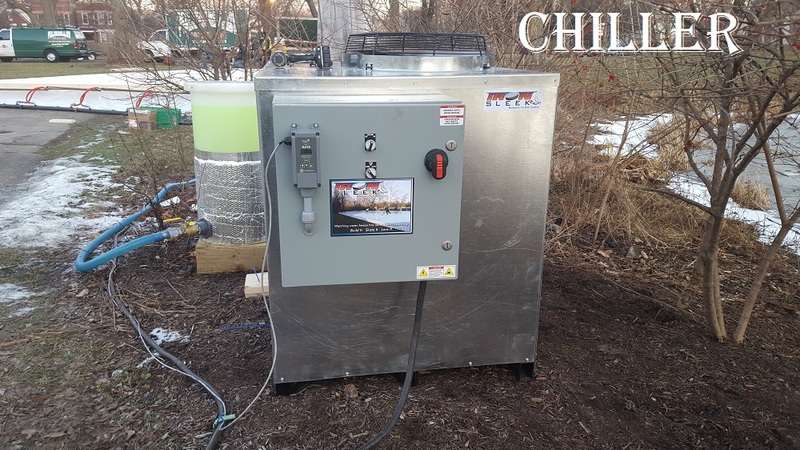 The opportunity here is that the AC will not run in the winter which allows you to utilize this unused power to supply your ice rink chiller. Larger rinks will need more current. Do not take this for granted, check in with us for some help in determining your power requirement for your rink. For commercial applications, 3 phase at 480 volts will greatly reduce your amperage demand for your wiring. 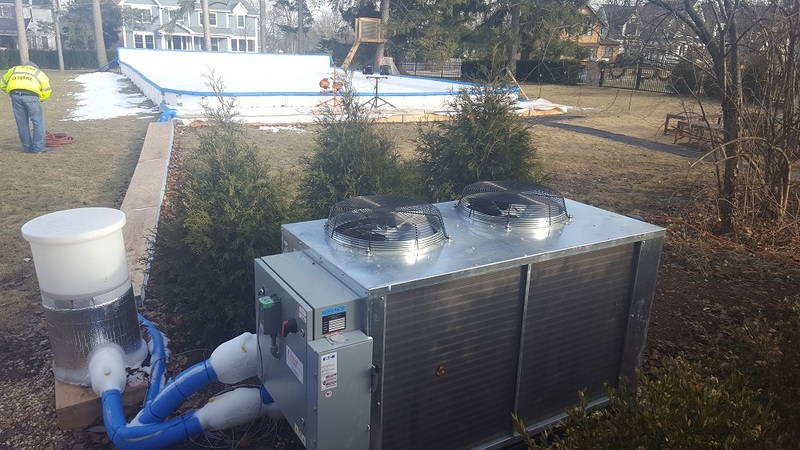 If you are moving from a natural backyard rink to a refrigerated rink, it is important to understand that a refrigerated rink will take a lot more planning. Please get in touch with us before the fall skating season. Like installing a pool, many factors are very custom. 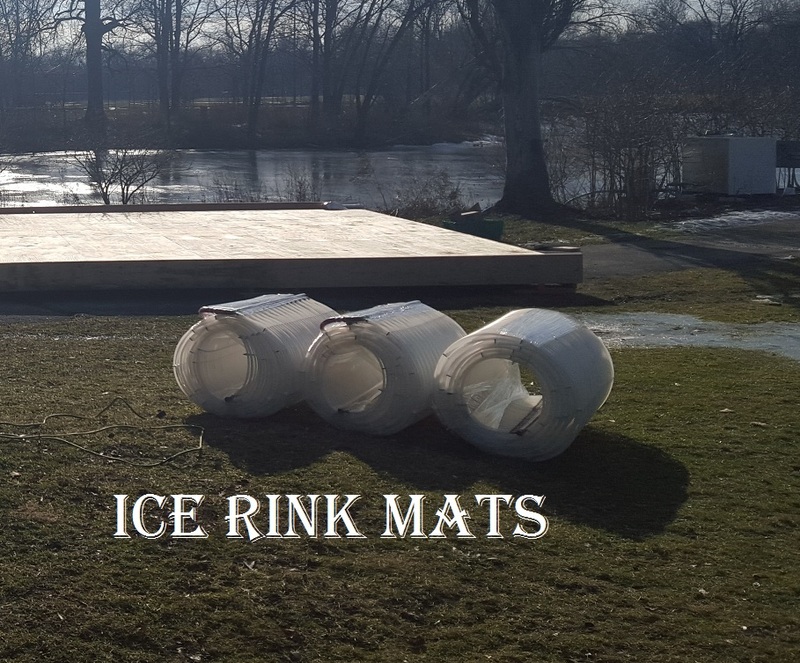 Rink mats are custom made, power will need to be supplied to code, Chiller will need to be placed, and you may need decking or excavation. PLAN, PLAN, PLAN. Refrigerated rinks are for families that have extra budget to spend on health and recreation. If you are a family that would consider putting in a pool or a sports court, a refrigerated rink may be a better alternative to consider. Many view it as an investment in their family's passions, health and wellbeing. A refrigerated rink is a big decision like a swimming pool or a sports court, but well worth it for families that love skating and hockey. In some parts of Canada, where the summer is shorter, a refrigerated rink is a more useful option. This has been growing popularity in the US because ice is great recreational activity. 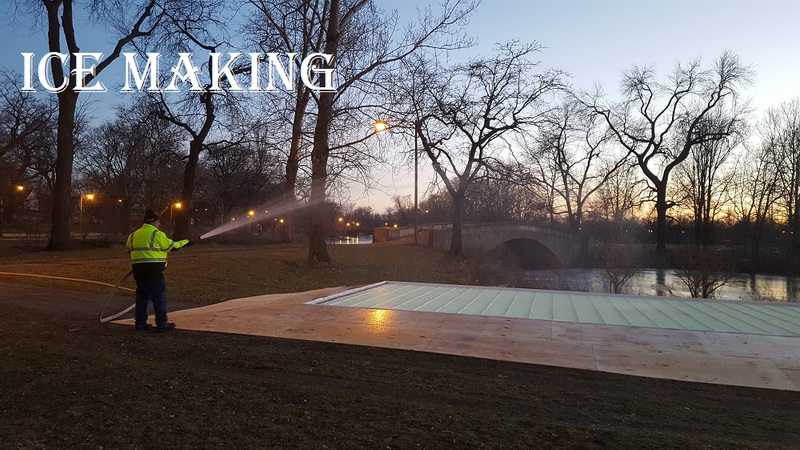 There are several already in Chicagoland and the East coast is already booming with residential refrigerated rinks. Increased number of skate days plus the "good weather days". One of the most compelling arguments for a refrigerated rink is that you can get over 100 skate days depending on where you live plus you get the coveted good days. With a natural rink, we may call a 5 degree Fahrenheit a skate day but is it really? There is actually only a small window of days where skating is truly enjoyable with natural ice. Imagine being able to skate outdoors when it is sunny and 45 degrees outside. 4 months of ice on demand. Planning for social events. 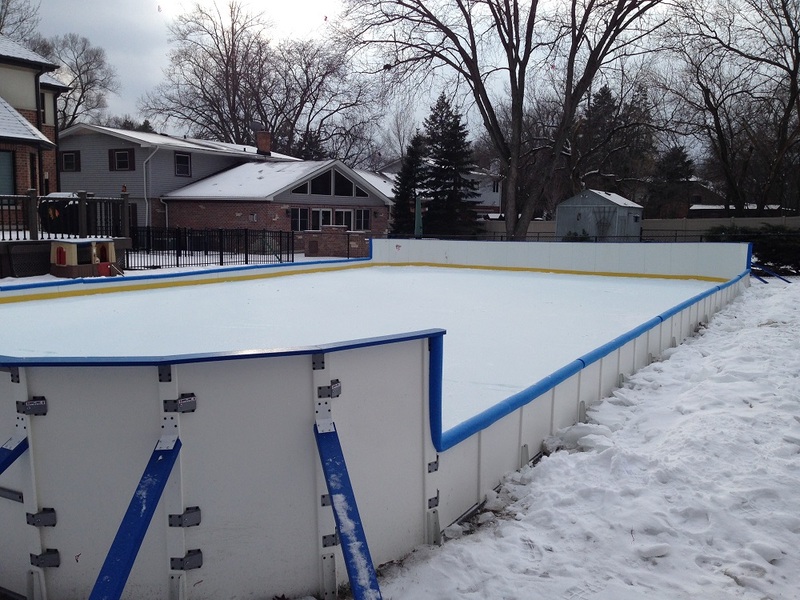 With a refrigerated rink, you will have ice when it is under 50 degrees. In the winter it is very unlikely that you will tip the scales over 50 F, you will now be able to plan birthday parties, family gatherings, and you will be able to have that long desired Christmas skate. Training. Figure skaters can have arena quality ice on demand to practice and enjoy their passion and to hone in their skating skills. Hockey players will be able to enjoy countless hours of INVALUABLE ice time which is very hard to come by. Resale value. When you grow out of your refrigerated rink, it still has a resale value. All the components in a refrigerated rink are off the shelf components that could be purchased at your local HVAC store and repaired a by a basic service technician. Used refrigerated rinks can be rebuilt fully and sold. Relocatable. If you want to move the rink to another spot, the rink can be moved. Not Real Estate. A portable refrigerated rink is personal property. If you change residences, the rink comes with you. 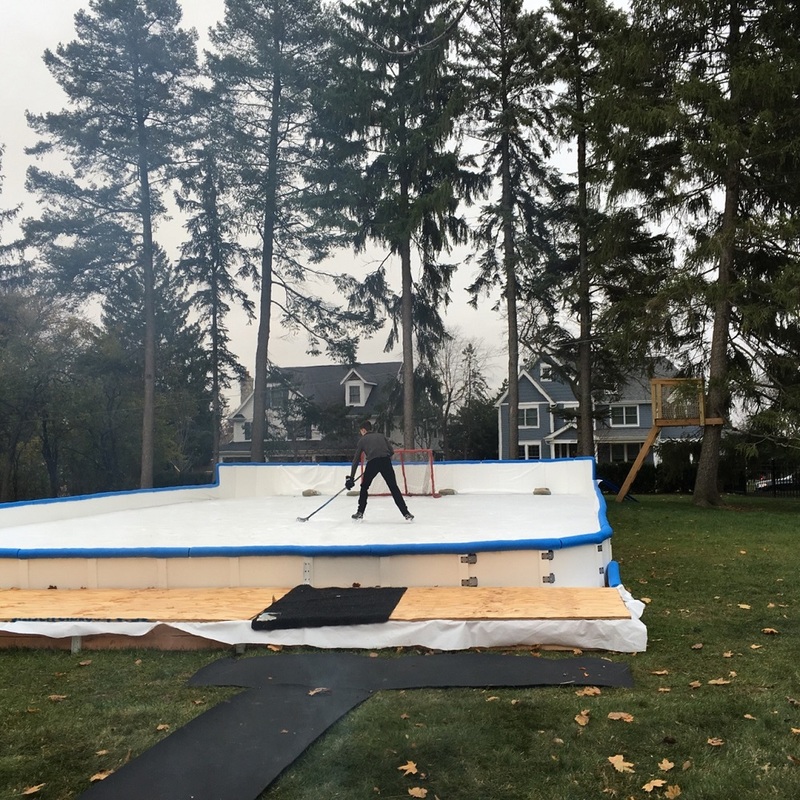 A portable rink is not an anchoring feature to real estate. Your home will remain flexible so that it could be sold to a larger audience. Consider this, some people would not buy a home that has a pool!! 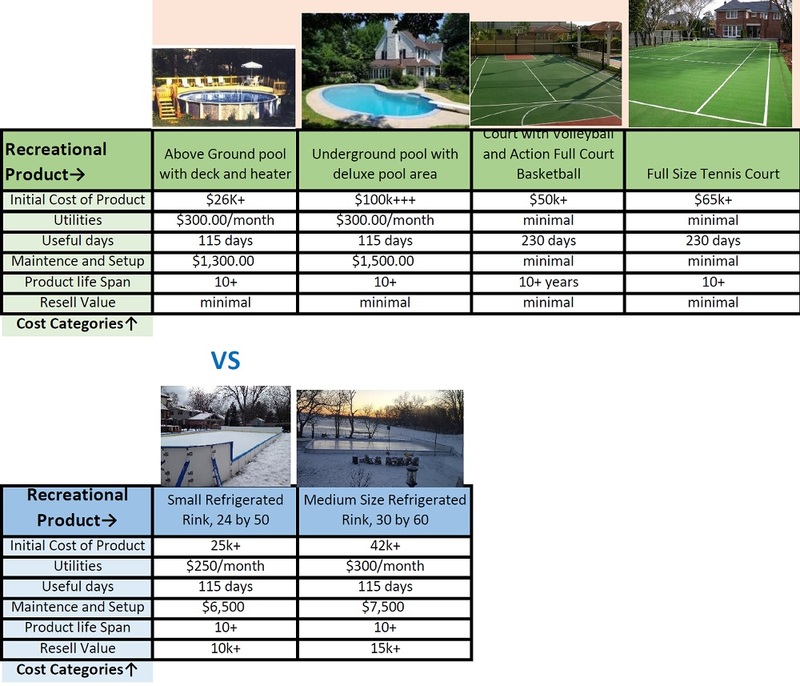 See Chart below to see how a Portable refrigerated rink stack up against other recreational options. If your intention is to use ice time to generated profit, a refrigerated rink is the best route. The bitter cold days are not pleasurable for paying customers but those days where the temperature is between 25 and 50 degrees F are magnificent for generating income. Winter weather is very unpredictable. When events need to be scheduled and ice needs to be guaranteed for commerce, a refrigerated rink is the only reasonable option. We have successfully helped bars, restaurants, parks and recs, and special events including film sets have ice on demand for money making opportunities. 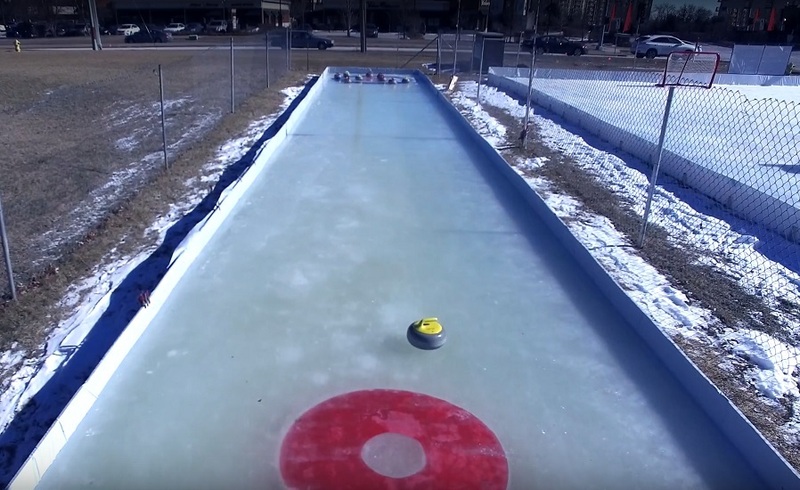 Curling, (actually bar curling) has proven to be a great activity for bar owners in the winter. See pictures below. Example of Bar Curling below. A beer garden, used mainly in the summer months, is converted to a winter destination for patons! 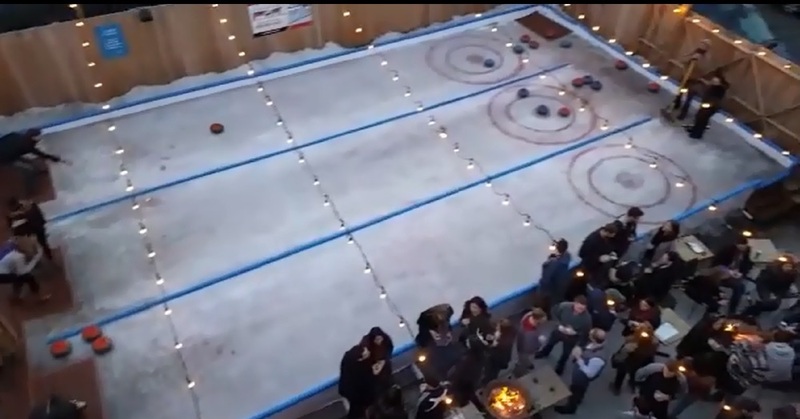 Check out this curling lane. A 7 ton Chiller can get the job done.